If your bathtub is worn out, damaged with chips and cracks, hard to clean, or an outdated, ugly color and you’re thinking about replacing it, consider an alternative that will save you time and money. With bathtub refinishing by Miracle Method, you’ll not only save thousands of dollars, but also days and even weeks of messy demolition and replacement. According to the National Kitchen and Bath Association, the total cost to remove and replace a bathtub is an estimated $3,000 or more, but Miracle Method’s bathtub refinishing will cost a fraction of that. Longevity. Using the same care and maintenance recommended by new bathtub manufacturers, a refinished bathtub should easily last 10 to 15 years or more. Durability. Because Miracle Method uses the most technologically advanced coating available, our finishes can withstand daily use and do not require special cleaning. However, just like a newly manufactured bathtub, refinished bathtubs can be chipped or scratched if subjected to extreme abuse. Aesthetics. The deep gloss created by our hi-tech acrylic coatings looks so much like new porcelain that 9 out of 10 people cannot tell the difference between our refinishing and a brand new tub. Superiority. 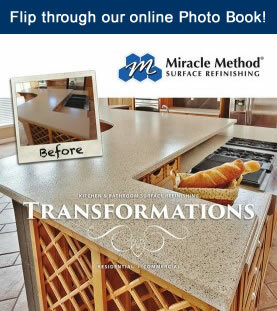 No other refinishing company uses the same steps that Miracle Method uses. From the diligent cleaning process to the use of our one-of-a-kind MM-4 bonding agent to the advanced coatings and final detailing, Miracle Method really stands apart. Experience. Miracle Method is the largest, most experienced refinishing company in the United States and has been the leader in refinishing techniques for nearly 30 years. 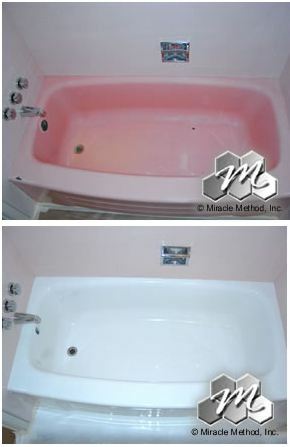 Having Miracle Method refinish your bathtub will not only save you time and money, but will also give you peace of mind that you’ve chosen a quality service to make your bathroom look and feel like new. Ask about our 5 year warranty. To find a Miracle Method closest to you, visit our online Locator or call 855-212-7337. I’ve already been sold on the idea of having my bathtub refinished instead of replaced, but this article managed to sell me even more. I didn’t realize how much the longevity would be increased by refinishing! The extra durability is another nice touch. Thanks for the information! Great! Do you need the phone number for your local Miracle Method franchise? We’d be more than happy to provide that for you.